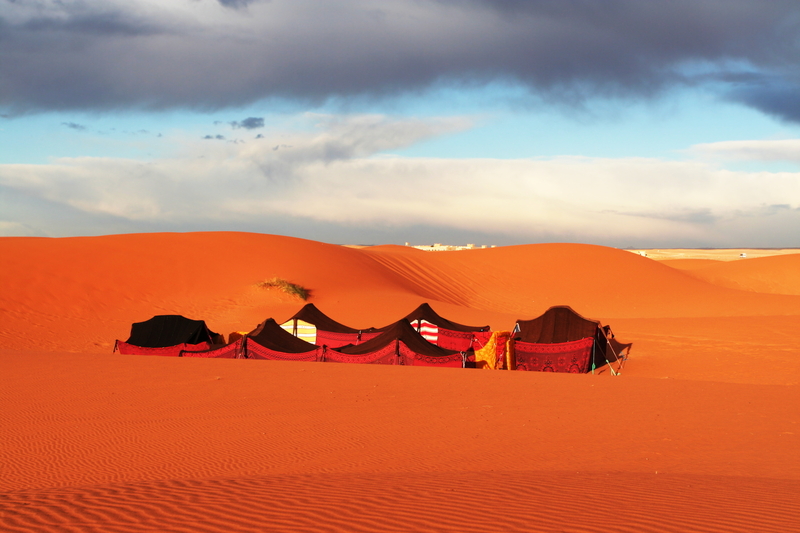 Celebrate New Years in Morocco’s Sahara Desert with the trip of a lifetime. Sahara Desert New Years Tours in Morocco are the perfect way to discover the Deep South’s Berber Villages, the Skoura palmeraie and its Valley of one-thousand kasbahs, UNESCO World Heritage Site Ait Benhaddou, the Dades Valley and Morocco’s Erg Chebbi Dunes. New Years Desert Tours can be tailor made for couples, families and groups to include a 3 Day Desert Trip, 4 Day Desert Trip or a 5 Day Desert Trip or 6 Day Desert Trip. All Sahara Desert New Years Tours include transport in 4×4 land cruiser, an English speaking multilingual driver/ guide, option of charming 4 or 4/5 Star Riads in the palmerie of Skoura, Riad in Ouarzazate, a Riad Spa in the Dades Gorge and a luxury Sahara Desert bivouac in the Erg Chebbi Dunes. Sunset and sunrise camel treks are accompanied by a three-course New Years Eve feast and festivities in the Moroccan Sahara desert’s Erg Chebbi Dunes with traditional Gnaoua music to compliment. New Years Desert Tours also include the option to go off the beaten track to dine with a Berber family for lunch in the middle of the Atlas mountains or visit ancient rock carvings in Tazarine. 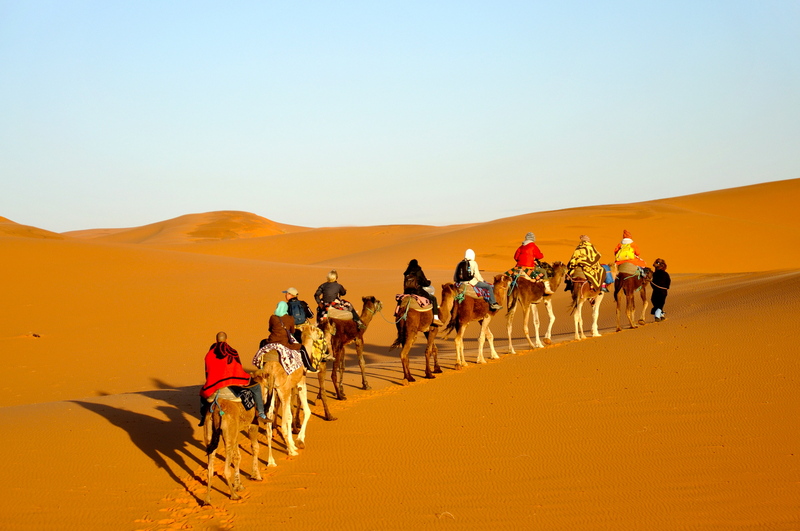 Spending New Years Eve in Morocco’s Sahara Desert is a treat for any Moroccan traveler. 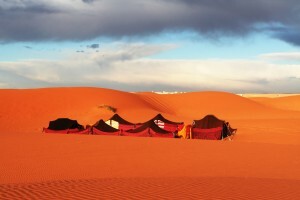 The highlights of Merzouga’s Erg Chebbi Dunes, their unique flora and fauna and the charm of a desert adventure should not be missed. ▪ December 31st – 9:00am – Departure from your Riad to visit Skoura, the Amerdihl Kasbah. Take the valley of one thousand Kasbahs and the Skoura palmary through the Valley of Roses also known as El Kelaa Des Mgouna. Optino to have lunch in the Valley and then continue the road to Erfoud. Discover Erfoud, famous for fossils, the Sahara Desert town of Rissani. Continue the road to the Erg Chebbi Dunes. Sunset camel trek into the Sahara Desert. New Years Celebration Feast at your bivouac camp deep in the Sahara Dunes under the midnight stars. ▪ January 1st – 9:00am – Sunrise camel trek and breakfast in the Sahara. Discover its windy roads by 4×4. Take the road back to Ouarzazate. En route to Ouarzazate, go by Alnif and have lunch of couscous in a traditional Moroccan village with a Berber family or take the road through Tinerhir past the Todra Gorge and onto Ouarzazate. Dinner and Overnight at a 4 Star Charming Riad in Ouarzazate with views of the Atlas Mountains. – January 2nd – 9:00am – Breakfast at your Riad. Visit the Valley of Nomads and have Tea with a Nomad family. Continue the road via the Dades Valley. Explore this region’s Dades Gorge and narrow road. Hike or walk the Dades Valley. Nightcap in Ouarzazte at a charming Riad Kasbah restaurant. 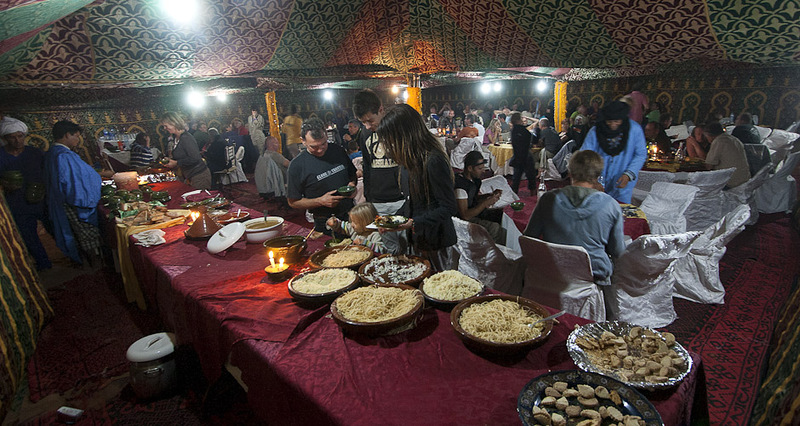 ODinner and Overnight at a 4 Star Charming Riad in Ouarzazate with views of the Atlas Mountains. – January 3rd – 9:00am – Breakfast at your Riad. Visit the Oasis of Fint. Tea ceremony and fresh baked bread with Azziz. Continue the road to Ait Benhaddou Kasbah, a UNESCO World Heritage site. Go for a short hike and have Lunch with views of this ancient Kasbah. Continue the road through the Ounila Valley back to Marrakech.